Let me share with you some observations and thoughts concerning what the future of education holds in three areas: (1) New Regulations; (2) Making money in education; (3) Blue Marble University development of new relevant programs. You may recall that early in the Republican Presidential nomination process, there was some discussion about doing away with the Department of Education. Well, that did not sit well with the federal bureaucracy. Like banks, they are determined to take over all of education–including higher education–by creating a bureaucracy so large that it cannot be “done away with”. One aspect of their attack, and in some ways a good one, is to eliminate “accreditation” altogether and replace it with direct licensing from (and payment of mega fees to) the US Department of Education. In a recent publication at page 12, the US Dept of Education has focused on accreditation as historically related to “seat time”, i.e. that in order for a degree program to be accredited, an institution must offer a certain number of courses that take a certain amount of time, e.g. a 4-year BA program. The Department has correctly recognized that “seat time” and hence “accreditation” is no longer relevant, but that a determination of competencies, achieved in whatever time the student can demonstrate proficiency, is what should be required. So, for sure, accreditation is essentially dead, and only exists temporarily for the funeral. The accreditation process will be replaced by a determination of competencies process supervised by the Department of Education. And in so doing, alternative education offerings such as Blue Marble will be benefitted since it will not matter where any education was acquired, but only whether a student can pass a “competency” exam on the subject. It will not be long before Professors must be licensed by the federal government to teach at a college or university. The PhD programs will be split into two tracks, one track for teaching and academic pursuits only, and one track for research and industrial applications. It is interesting to note that we have had many inquiries from students in Africa (many countries there are English speaking), and not one was concerned nor inquired concerning our status of accreditation. These students just liked the programs. Consequently, Blue Marble University has positioned itself as an alternative education provider which can offer the programs we want to, any way we want to do it, and deliver the programs students want. We are going to innovate and not be told how to do it. We are not going to pay outrageous fees to be passed to our students for the privilege of being regulated. It is estimated that you the student is charged $2500-$3500 per year for the “accreditation cost” of traditional institutions. Are you really willing to pay for that?? We have concluded that employers don’t concern themselves with “is your degree accredited”…they just want someone who can do the job and contribute to their success. We hope and intend to help people with their educational needs and to provide something very worthwhile. I am trying to build the kind of institution that my family can make use of and be proud of, and I hope of course that others may find our programs useful, relevant, and economical. Every one of our programs is priced at $2,950 USD/year, and we hope and intend to stick to that for awhile. So, my making a lot of money from Blue Marble is still also a “hope”, but that is OK, as I enjoy receiving the letters of appreciation from graduating students. The enrollment at the University of Phoenix (the major online player) was down 42% a couple of years ago!!! And I figure, if it is down there, it is down everywhere. So, we are hitting the market at a time when people are not finding the acquisition of further education to be useful nor leading to satisfactory jobs and careers. In this new world economy, the market has already spoken: higher education as currently formulated and priced is neither relevant nor useful. I never realized I lived my entire life during the boom years which are now over and never coming back. I am convinced that making money as a provider of higher education demands highly relevant programs pointing to a career, and delivered at an affordable cost….a cost so affordable that student loans are not required. Moreover, I feel that the graduating high school student should and will eventually proceed to some type of job or entrepreneurial opportunity, and fill in with more education on a part-time basis, online, as needed and as can be paid for. Which is why I believe that the standard BA or BS degrees are worthless and have no value (except for a BS in the narrow field of computer science, and even then, I think an online portfolio of what you can do even beats that). In developing our programs, I have tried to tie a shortened BS program to a doctoral or masters degree so that the graduating student has a more advanced degree. I believe students are looking for shortened programs. And this includes shortened doctoral programs. All of our international inquiries are from people that already have basic or even masters degrees and are intrigued by our shortened doctoral degrees which don’t require residency. You make money by finding out what people want and delivering a good product to them. But our naive American students growing up in a Brittany Spears world with their heads in Facebook and Twitter don’t know what they want in education…that’s a problem for an innovative offering such as ours. People don’t recognize how different and superior we really are. Education also has a global element to it and is being commoditized. First of all, the USA is not so much the leader it once was. For example, 10 years ago, Thailand was the first country in the world to offer an online PhD in Instructional Technology (in English), recognizing that education was moving online and people needed to be trained in the delivery of online programs. Thailand also introduced a licensing program for purely online instituitons. 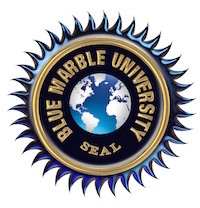 Ten years later, does the USA have a licensing mechanism for online universities such as Blue Marble University?? Of course not. Nor is there any interest in permitting low cost online education in the US that I can see. If I told you the Philippines had a top rated medical school the graduates of which are qualified to practice in the USA, that accepted foreigners, the program was in English, and cost $3500 per year, where would you send your kid for a medical education? I know the answer for mine. An Indian business school offers a one year online MBA for $1400, which is recognized for employment in the US. Smart people are looking globally for education, and students in Africa, India and other developing countries appear interested in Blue Marble University because they can earn a professional degree and don’t have to leave their home countries, plus, we are affordable to even an international student. Of course, the word is not out. How many high school students or their parents in America consider or investigate overseas programs??? Or non-traditional alternative educational programs? Probably essentially none, so successful has the propaganda been. And so, this is our biggest problem…the lack of an educated consumer. So we are undoubtedly ahead of the curve, I just hope not too far ahead!! These comments are my own observations as an expat that escaped from America and lives in Thailand and who along the way acquired an international view of things. As I said, with the boom years going back to 1944 now over, where does a young person look to make their fortune now? A. Entrepreneurism and self-employment. Rather than fork over a ton of money pursuing a standard bill of fare undergraduate education, a student should begin an apprenticeship, obtain employment where one can learn business management skills, or try starting a small business. Where does the money come from to start a business? One of my Nepal entrepreneur friends put it this way: “You don’t raise money to start a company, you start a company to make money”!!!! Wow, I never thought of it like that. “Dear Students: Don’t Let College Unplug Your Future”, an essay by Dr. Gideon Burton, in which the irrelevance of an undergraduate education is highlighted and the concept of the digital online portfolio of accomplishments and training is introduced. This served as the basis for our requirement that every student generate a Digital Portfolio. The idea that evolves is that students should get out into the world and learn business management skills on the job while pursuing education part-time or as an adjunct activity. It is along the lines of looking at being an entrepreneur or engaging in self employment early on and foregoing the “looking for a job” mentality. This is a terrific, novel, innovative program, guaranteed to get you interviews. C. The Blue Marble University “China Program”: I stumbled upon this idea by accident. It is said that in 30 years there will only be three languages: English, Spanish, and Chinese. In Thailand I noticed they are starting to investigate how to incorporate Chinese language into the grade school curriculum, along with English which they already do side by side with Thai. I happened to check the internet for jobs available for those proficient in Chinese and I was astounded at the quantity and quality of jobs for Chinese speakers in every industry, every company, EVERY agency of the federal government, almost all State governments, not to mention very lucrative jobs available with US companies with off shore offices or sales operations. If you can speak/read Chinese, you don’t even have to look for a job, you can just point to who you want to work for and where. Blue Marble University offers a combined Chinese Language/General Business program that teaches Mandarin Chinese online via video lectures and one on one interaction with a native Chinese speaker. We have identified excellent and affordable sources in China itself, but the main problem is that while one on one is available, time zone issues make this unworkable and many China based language programs have not transitioned to video as yet. However, we now have two very good sources for our China Program. I know this program is on the money and if any students can warm up to the idea of learning Chinese, they will be set for life financially. D. The Blue Marble University 5-year online BS/DSc in Applied Biology: I recently read a report that indicated the world will run out of food in 30-35 years. At first, this sounds ridiculous, but here in Thailand I have noticed a few changes. When I first arrived here 10 years ago, we had an excellent variety and quality of fresh fruit and vegetables, all produced domestically. Now, 10 years later, as a result of flooding of rural areas, and the loss of agricultural land to development, almost 75% of the fruit and vegetables come from China. A scary thought as that was the country that tried to sell fake milk to its own people (they executed that guy!). A certain fish caught locally in Thai waters is a staple here, and now I have just learned that most of that kind of fish is imported from Burma. Things are definitely changing, although one cannot see the changes on the surface. Everything still looks the same. America is a rich country and will be able to continue to acquire its imported food, as most of the USA food comes from overseas. But….while it is likely to be available, the cost will become prohibitive. In the near future, those that know how to graft fruit producing trees onto other stock to shorten the time to fruit, or who know how to use plant tissue culturing techniques will be in high demand. In Thailand, the entire strawberry crop arises in the lab. The growers obtain the seedlings which are generated in a test tube. My 92 year old mother says: There are no famous farmers, only famous doctors. That is about to change, and sooner than we think. Our Applied Biology program is a terrific program which addresses what will become a world-wide problem…food. All the second year courses in our doctoral portion of the program are presented with this focus in mind. I have not intended here to speak to all of our very exciting programs, only to highlight a few which are particularly cogent. People that know me already know my interest in and commitment to stem cell treatment applications and stem cell education. As Warren Buffet says about investing: “Know what you have and why you have it”. So too, I feel every program that we offer must be important and relevant, and there must be a reason for offering it. Some of our programs currently listed on our website may be changed or dropped as not meeting updated criteria for why we are offering it.